A medium sized room with low lighting. Chairs and a kneeler face an empty cross. (We painted ours black.) 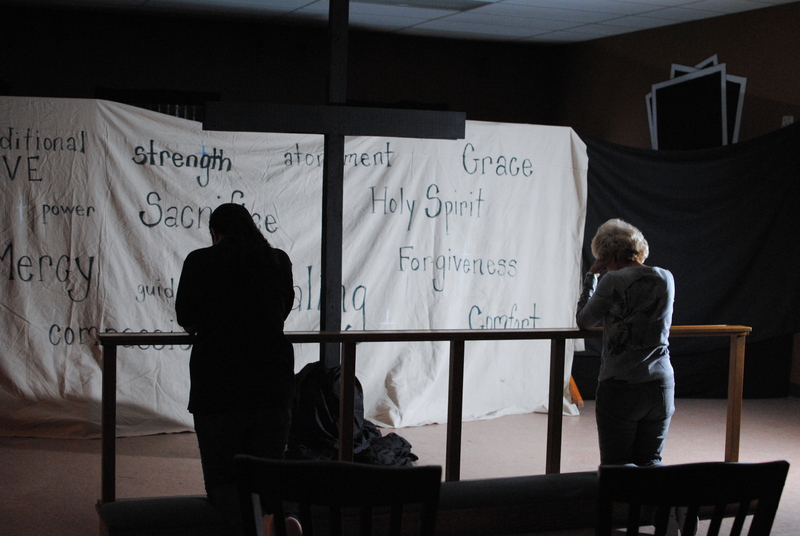 We then painted the following words for reflection on a canvas drop cloth, hung it behind the cross, and illumined it with a spotlight: unconditional love, power, mercy, life, compassion, guidance, obedience, strength, sacrifice, healing, atonement, grace, Holy Spirit, forgiveness, and comfort. 1. As persons enter the room, they read the following: Thanks be to God, who gives us the victory through our Lord Jesus Christ. (1 Corinthians 15:57 NRSV) The unconditional love of God brought Jesus to earth to die so that you may live. Reflect upon His sacrifice. Thank God for the gift of forgiveness and the gift of new life available to you through Christ. 2. Persons may sit or kneel for their time of reflection and prayer. Have tissues available as well as pen and paper for journaling. A small group leader prepares a group of teens for their reflection time. photo by Lisa Ann Moss Degrenia. As I knelt before the cross, I slowly read the words. All were important in their own way, yet the word I returned to again and again was guidance. I remembered a story where the word guidance was broken apart to mean “God ‘u’ and ‘i’ dance.” I imagine gliding and spinning and leaping, all moves which require lightness of foot and freedom of movement. What has me earthbound in this season of shedding- shedding false understandings, shedding sin sick ways, shedding illusions of God and self, shedding stumbling blocks and inhibitions? What must be nailed to the cross so that the grace of God might flow freely in me and through me? This station is the second of four prayer stations designed for use on Ash Wednesday. They could of course be used anytime when the themes for self reflection and prayer include our mortality, our sorrow for our sin, and re-commitment to living in alignment with God’s holy will. prayer station © 2012 Lisa Ann Moss Degrenia and Nicole Sallee. You are welcome to use this work in a worship setting with proper attribution. Please contact Lisa for information and permission to publish this work in any form. Leap of Faith © 2011 Lisa Ann Moss Degrenia. You are welcome to use this work in a worship setting with proper attribution. Please contact Lisa for information and permission to publish this work in any form. For more information on the scripture translation, photos and the use of this resource in other settings, please refer to the copyright information page. A large room with low lighting. 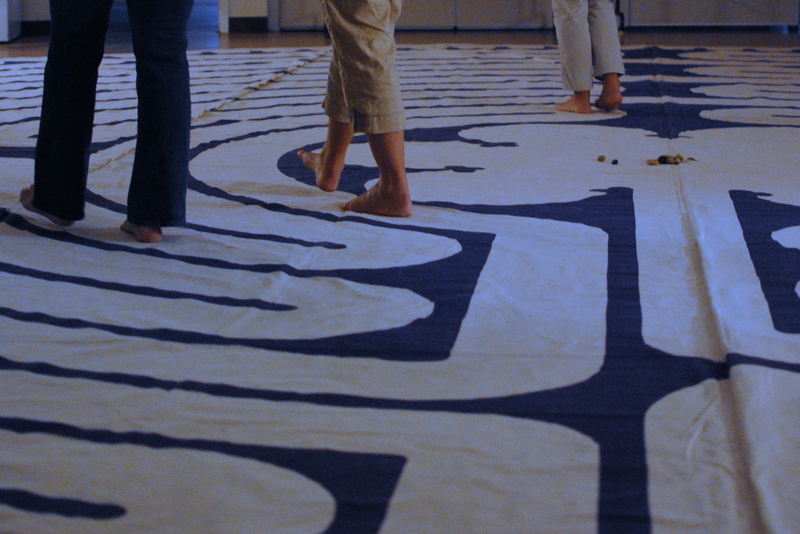 In the middle of the room is a canvas prayer labyrinth. 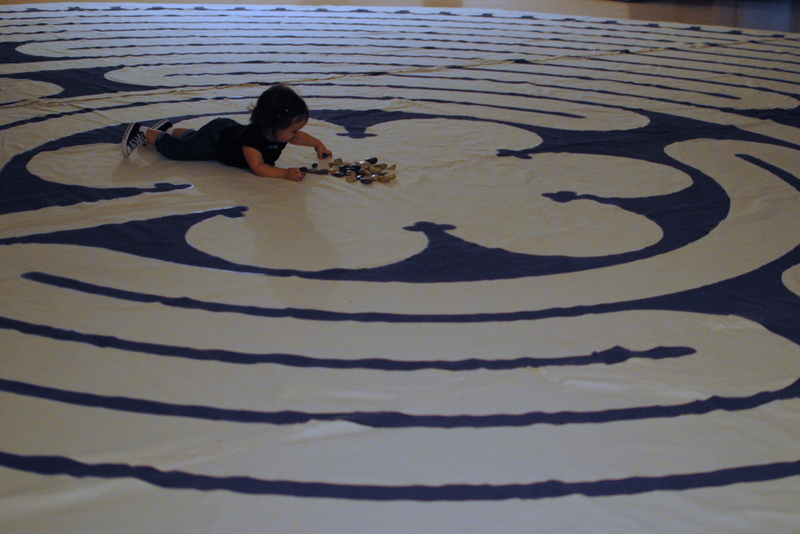 Prayer labyrinths help people to take a spiritual journey. They have been around for a thousand years. The theme for this walk is confession and forgiveness. 1. As participants enter the room, they are invited to sign in. 2. They read Rend Your Hearts, a Blessing for Ash Wednesday by Jan L. Richardson. 3. They receive ashes applied to their forehead in the shape of a cross. The host speaks the words, “Remember you are dust and to dust you shall return. Repent and believe the Gospel,” as the ashes are applied. 4. The participants remove their shoes. 5. The participants read the following: All have sinned and fall short of the glory of God. (Romans 3:23 NRSV). If we confess our sins, God who is faithful and just will forgive us our sins and cleanse us from all unrighteousness. (1 John 1:9 NRSV) Take a rock to symbolize the weight of guilt that we hold when we carry sin in our lives. As you walk through the labyrinth towards the center, walk with Christ and use that time to ask for forgiveness for these sins. When you reach the center, leave your rock there and know that when you release your burdens to the Lord, you can walk away free and without shame. In Christ, God has forgiven you and taken the load you bear. 6. The participants choose a rock from a basket of rocks and walk/pray the prayer labyrinth as instructed, walking to the center and following the same path back out. 7. The participants put their shoes back on and move to the next prayer station. 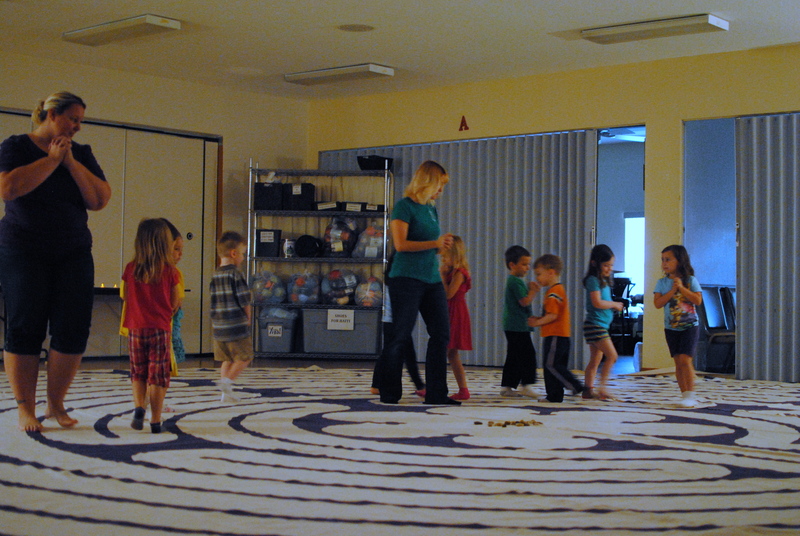 Watching persons walk the labyrinth can be as moving an experience as walking it yourself. Much of Ash Wednesday, I had the joy of welcoming persons and explaining the meaning of this type of spiritual journey. Here’s just a few of the stories. 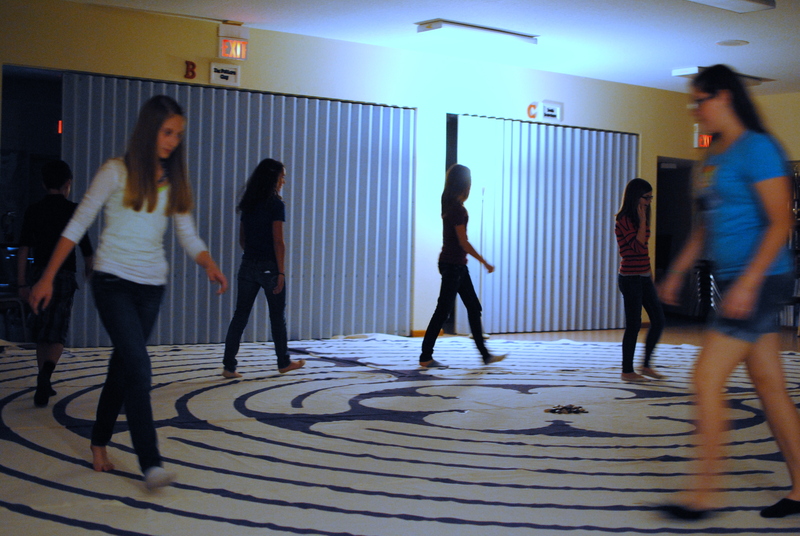 A small group leader said her rock felt lighter and lighter as she approached the center of the labyrinth. A mom who came earlier in the day later brought back her whole family and a few of the neighborhood children. She walked the path again, this time carrying her infant son. Her husband carried him on the way back out of the labyrinth. The children stopped and prayed with each other when they reached the center, a sacred circle of siblings and friends. An elderly gentleman who confessed, “I tend to wander from the path.” He said this experience was the most profound Ash Wednesday experience he had ever had. In the quiet of the afternoon, I had a chance to walk the labyrinth myself. Each time I walk one, the experience is different. During my walk, I was joined by a frail women who had just come from a cancer treatment. As we made our way, her struggle was evident. This could be her last Lenten journey. It could be mine. The ashes on her head spoke of her reality, a mortality we all share, “From dust you were born and to dust you shall return.” She chose to shorten her journey to the center. There she prayed and released her rock and her other burdens. A huge THANK YOU to our friends at St. Luke’s United Methodist Church in Orlando, Florida for lending us their canvas prayer labyrinth. This station is the first of four prayer stations designed for use on Ash Wednesday. They could of course be used anytime when the themes for self reflection and prayer include our mortality, our sorrow for our sin, and recommitment to living in alignment with God’s holy will. © 2012 Lisa Ann Moss Degrenia and Nicole Sallee. You are welcome to use this work in a worship setting with proper attribution. Please contact Lisa for information and permission to publish this work in any form. 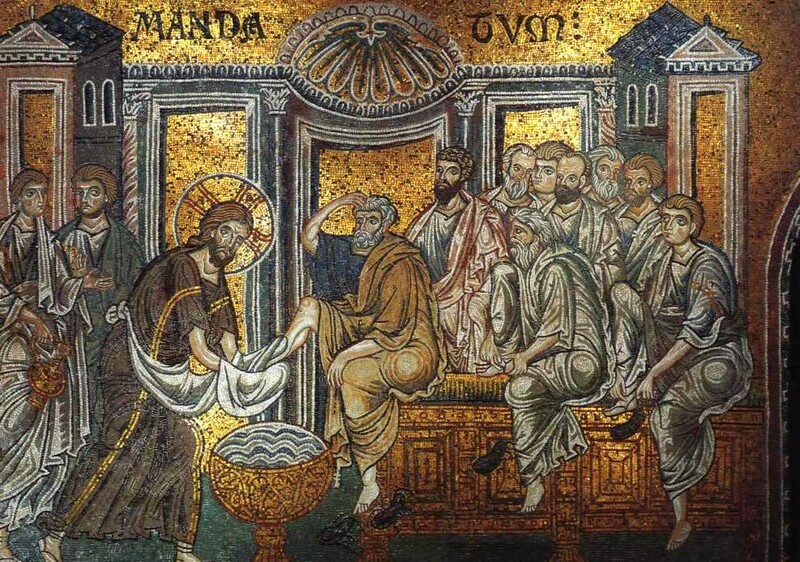 Byzantine mosaic of Christ washing the disciples’ feet at the Monreale Cathedral. Public Domain. In this setting, you have the option of incorporating the first verse of The Servant Song throughout the reading. (The Faith We Sing #2222; CCLI # 72673) If you do incorporate the song, consider having the instrumentalists continue to play softly during the readings. Lord, are you going to wash my feet? No! You shall never wash my feet. Unless I wash you, you have no part with me. For Jesus knew who was going to betray him, and that was why he said not every one was clean. When he had finished washing their feet, he put on his clothes and returned to his place. we know for certain that he cannot enter save by the door of our consent. Temptation is the devil looking through the keyhole. Yielding is opening the door and inviting him in. It is a mark of the evil spirit to take on the appearance of an angel of light. He begins by whispering thoughts that are suited to a devout soul and ends by suggesting his own. There is no greater victory of evil than the reaction of guilt and despair which it arouses in those who have committed a sin, or of fear, anger and hate in those who have been wronged. Conversely, there is no greater victory over evil than to refuse to give in to these feelings, to refuse to act on them, to harbor them or justify them. We defeat evil – in ourselves, in others or in the world – when we refuse to react to it with more evil, but respond to it with repentance, forgiveness, and love. but temptation shows us who we are. But remember that the temptations that come into your life are no different from what others experience. And God is faithful. He will keep the temptation from becoming so strong that you can’t stand up against it. When you are tempted, he will show you a way out so that you will not give in to it. Discipline yourselves, keep alert. Like a roaring lion your adversary, the devil prowls around, looking for someone to devour. Resist him, steadfast in your faith, for you know that your brothers and sisters in all the world are undergoing the same kinds of suffering. And after you have suffered for a little while, the God of all grace, who has called you to his eternal glory in Christ, will himself restore, support, strengthen, and establish you. Jesus went to the wilderness – a place of wild beasts and demons; of roaming, tormented spirits; the dangerous meeting place of God and frail human beings; the strange abode of ministering angels. Here the devil prowls like a roaring lion seeking souls to devour. 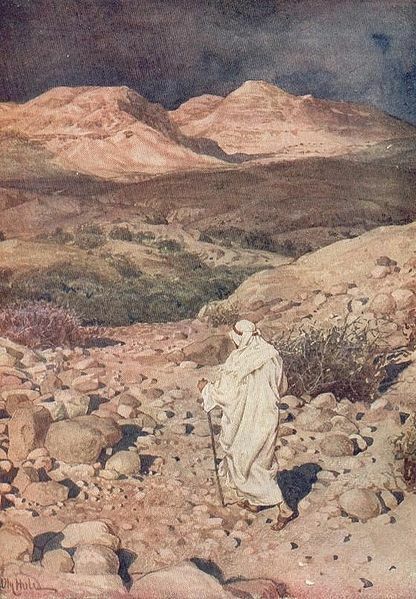 In Lent, Christians are called again to the soul’s desert, but without John the Baptist for an Advent guide. Rather, as John of the Cross wrote, we go forth with no other light or guide than the one burning in my heart. You lone are my belonging. In you, O Lord, I seek refuge; do not let me ever be put to shame; in your righteousness deliver me. Incline your ear to me; rescue me speedily. Be a rock of refuge for me, a strong fortress to save me. You are indeed my rock and my fortress; for your name’s sake lead me and guide me, take me out of the net that is hidden for me, for you are my refuge. Into your hand I commit my spirit; you have redeemed me, O Lord, faithful God. 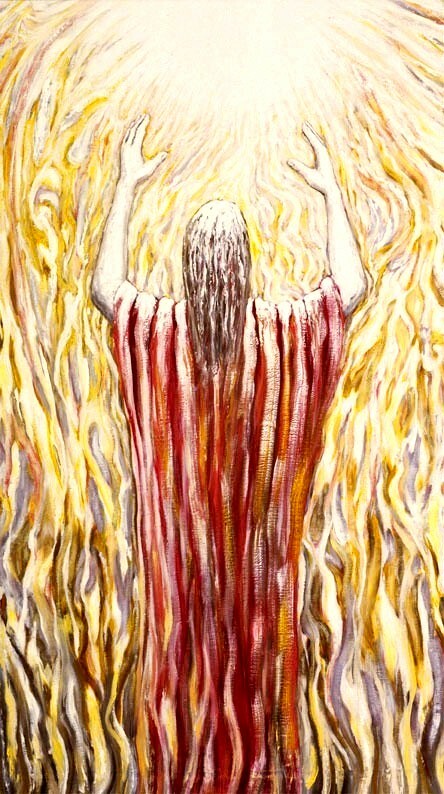 For more information on the art, scripture translations and the use of this post in other settings, please leave a comment. We are also offering a continuous Ash Wednesday Prayer Experience from 10am-9pm in the church cafe. 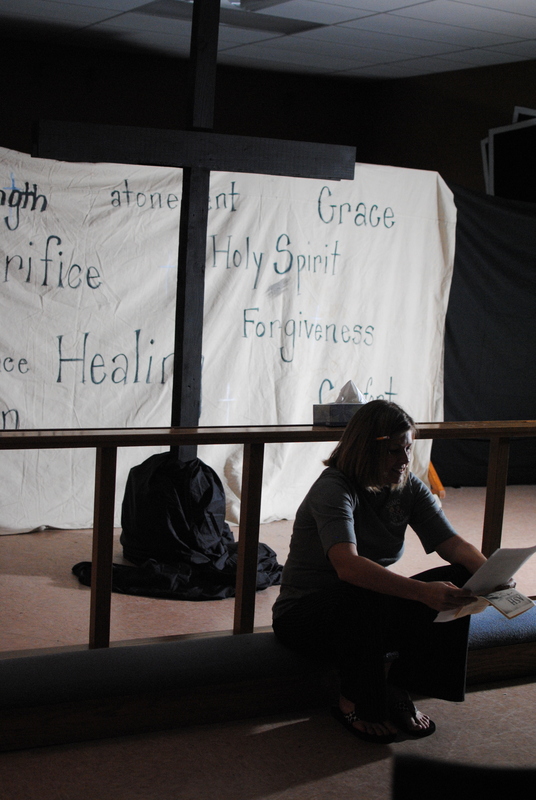 The Ash Wednesday Prayer experience includes an opportunity to walk a prayer labyrinth, contemplative prayer stations, and commitment stations. The Prayer Experience and Services welcome persons of all ages. Consider this is your official invitation to join us at Community United Methodist Church in DeBary for our many Lenten services and events, including our Passion Week Experience during Holy Week. On Sunday mornings during Lent, our sermon series will be Final Words, Final Meal: what Jesus taught at the Last Supper (Gospel of John, chapters 13-17). I took this picture on the campus of Florida Southern College in Lakeland, Florida during a morning devotional walk. 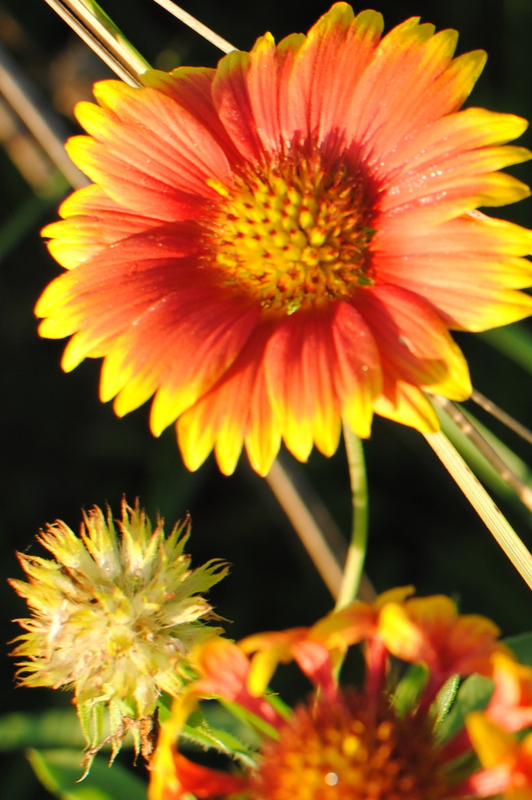 The joyful colors reflect Julie's joyful heart and the spirit of her prayer. For more information on the use of this resource in other settings, please refer to the copyright information page.